Chemical containment solutions for conventional set ups, High Performance, Low Flow, ADA, Walk-In, Teaching /Demonstration environments and more. First and foremost a fume hood is a device that is engineered to provide safety for it’s users. It is also where a laboratory has it’s highest cost of energy. Keeping these two very important needs in mind is what has caused CiF to develop the Apex Air Series of fume hoods. A chemical containment hood that incorporates a ventilation system within its construction design. This fume hood series is made up of a series of standard construction methods that are effective in laboratories that are designed around constant air volume or variable air volume systems. The hoods are independently third party tested to the standard ASHRAE 110 testing procedure that drives our industry. They are preconfigured to accommodate today’s requirements with additional fixture locations pre-drilled and capped for tomorrow’s needs. Like the LP series, this fume hood series is designed for a fume hood intensive environment, like you would expect to find in a research and development lab site. It is designed to perform to a High Performance, Low Flow specification…having been tested to the NIH (National Institute of Health) modified protocol of 60 FPM full open sash height. 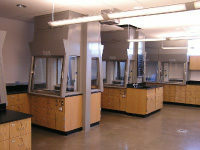 Teaching environments frequently call for laboratory lectures or experiment observation. 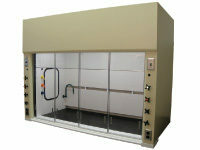 These fume hood models offer different options to increase site lines and allow dual sided entry points.